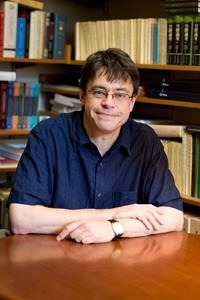 Michael Puett is Walter C. Klein Professor of Chinese History at the Department of East Asian Languages and Civilizations and Chair of the Committee on the Study of Religion at Harvard University. In 2011, he worked at the International Research Consortium for Research in the Humanities “Fate, Freedom and Prognostication in East Asia and Europe” (IKGF) at FAU as a Visiting Fellow. Since then, he has been a member of the scientific advisory board of the IKGF. He is also a non-resident long-term fellow for programs in anthropological and historical sciences and the languages and civilizations of East Asia at the Swedish Collegium for Advanced Study, Uppsala. Furthermore, Michael Puett was visiting professor in France and Singapore and Senior Research Fellow at the Max Planck Institute for the History of Science, Berlin. Puett joined the Harvard faculty in 1994 after earning his M.A. and Ph.D. from the Department of Anthropology at the University of Chicago. His interests focus on the inter-relations between religion, anthropology, history, and philosophy. In his research, Puett aims to bring the study of China into larger historical and comparative frameworks. He has published five books, numerous articles as well as conference papers on early Chinese history, and on classical Chinese ritual, social, and political theory. Puett has received multiple awards for his teaching and advising, such as the Joseph R. Levenson Memorial Teaching Prize in 2008. Since 2012, his General Education course, “Classical Chinese Ethical and Political Theory,” has been the third most enrolled undergraduate course at Harvard. In 2016, Michael Puett became a Foreign Member of the Royal Swedish Academy of Science. By appointing Professor Puett as FAU-Ambassador, FAU honours an outstanding Sinologist who can vitally foster the internationalisation and profiling of the science location Erlangen with his transnational network. Professor Puett, what do you see as your main objectives as FAU-Ambassador? I hope to do everything I can to spread the word about the tremendously exciting cosmopolitan family that FAU is creating, as well as to continue to work closely and collaborate with the extraordinary scholars at FAU. You were a Visiting Fellow at the International Research Consortium for Research in the Humanities „Fate, Freedom and Prognostication in East Asia and Europe” (IKGF) in Erlangen. What made you choose FAU as your host university for a research stay? I chose FAU because it has such an extraordinarily vibrant intellectual culture. The IKGF in particular is a wonderful, and highly international, community. I found my time at FAU to be very inspiring. You specialize on China Studies, specifically the framework of philosophy, anthropology, history, and religion. What initially sparked your interest in this field? I was initially trained in European intellectual history and philosophy, and I became interested in the Chinese tradition in order to explore the development of a different intellectual tradition. Your lectures are among the most popular classes at Harvard. What can current students learn from analyzing classical Chinese texts? Studying classical Chinese texts helps students question many of their fundamental assumptions about the self, society, and the political world. I always tell my students that they do not have to agree with the arguments in the classical Chinese texts, but they should try to take the ideas seriously and thus realize that ideas they take for granted are only one possible way of thinking – and perhaps not always the best way. I love how cosmopolitan FAU is, and I love the international focus of FAU. This is something all universities should strive to emulate. One of my first impressions of the Erlangen-Nuremberg region was how nice and welcoming people are. That impression has most certainly stayed with me on every subsequent visit! The quality of life in Erlangen is wonderful. I always love my stays there. I highly recommend students and young researchers to choose FAU for a stay abroad. They would find FAU to be a very exciting academic community, and Erlangen to be an enjoyable place to live. Is there anything that a visiting researcher should definitely remember to bring for their stay at FAU? The only thing they need to bring is a willingness to appreciate intellectual stimulation and to enjoy life! Can you tell us some of your favourite places at FAU and in the region? I always love reading in the Schlossgarten, and often take evening walks through the Burgberggarten. The Germanisches Nationalmuseum in Nuremberg is another place I love. And, of course, the Christmas Market in Nuremberg is amazing! What has always impressed me deeply at FAU are the conversations with faculty and students. The intellectual culture at FAU is highly stimulating. Just how deeply honored I am to serve as an FAU Ambassador, and how much I look forward to continuing to be a part of the extraordinary FAU Family. Thank you so much again!